The first Tournament of Roses Parade was staged in 1890 by members of Pasadena's Valley Hunt Club, former residents of the East and Midwest eager to showcase their new home's mild winter weather. The Rose Parade began with Horse Drawn Rose Covered Carriages. 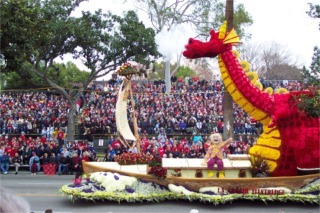 The first film of the Rose Parade was shot by Thomas Alva Edison on paper film. 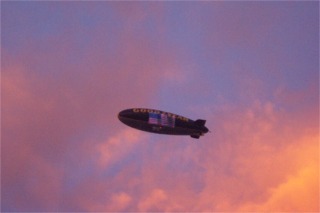 As you can see from this photo we were greeted with a beautiful sunrise. But, the clouds took over and in the rest of the photos there was NO blue sky. The temperature was ok though as long as you dressed warm. Air Force jets fly over at the start and then a Stealth Bomber flew over. It is quite a site to see. 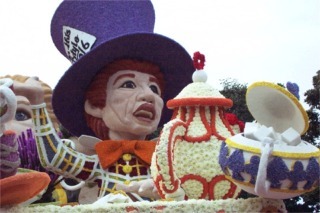 This was one of the first floats. It had 50 ft. tall dinosaurs in front of this colorful guy. Their long necks went up and down as they were chomping on vegetation. This float was sponsored by Kodak. Every inch of all floats must be covered with flowers or other natural materials, such as leaves, seeds, or bark. 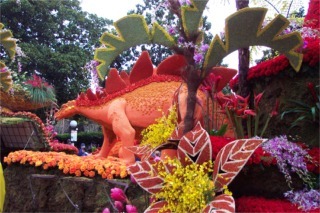 This float was sponsored by FTD had had some very unusual flowers. It had an Alice in Wonderland Theme. The parade is really a big thing here. They start the next year's parade as soon as this one is completed. The floats are built out of a mesh of steel and chicken wire. We had seats down near the start. We arrived early so we could walk down and see the floats up close before it started. This shot was taken from our seats. This float was sponsored by one of the local cities. It is one of the few that was NOT built by one of the float building companies. It was built by volunteers. 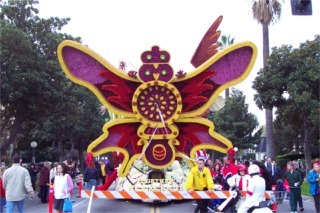 The Vietnamese Cultural House float was sponsored and built by a Vietnamese woman who sold her house to pay for the float. She is so happy to be living in the USA that it was her way of saying thanks. It was also the first time the Vietnamese culture had been represented in the parade. This was the Panda Express float. From the side there are people pulling it and it is a long Chinese Dragon. The Rose Parade and Rose Bowl bring tremendous amounts of cash to the area. Even more so this year since the two events were not on the same day. Folks stayed in town longer. Spectators who do not purchase bleacher seats are permitted to claim thier "spot" by camping out on the sidewalk at noon on New Year's Eve. They had more then 1 million people lining the street. The parade route is 5-1/2 miles long.